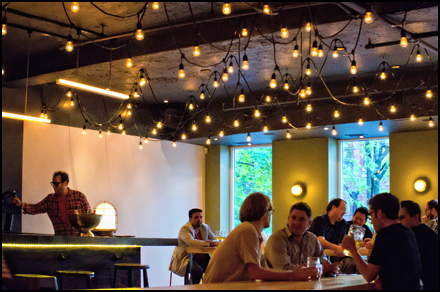 On May 26, Aldo Lanzillotta opened the doors on WVRST, serving Toronto something new and refreshingly unpretentious. It’s about sausages and beer, and is done in the sort of inclusive atmosphere that defines the best of our city. Long communal tables that encourage touching fill the 4,000-square-foot space at 609 King Street West, just east of Bathurst. A striking bright red wall is adorned with the restaurant’s name on one side of the room and on the other is a sleek bar that pours out 16 draft beers (Weihenstephan hefeweizen and Urthel IPA among them) and 15 bottles that include Dieu du Ciel’s Corne du Diable ($7) and Derniere Volonte ($7). Strings of tiny light bulbs hang from black wires overhead, a DJ spins a mix of funky tunes, and Aldo and his cheerful staff walk around making sure empties are cleared and the tables remain uncluttered. On the far end of the room is the starring attraction: Trays of plump sausages behind a case, presented the way you might expect to see them at a butcher’s shop. “I wanted to create a place that was affordable, unpretentious and fun,” Lanzillotta said once he had delivered my order of Dieu du Ciel. He said after working in Michelin-starred restaurants in the States and at other fine-dining establishments — including Susur and Canoe — he wanted a restaurant that was inviting while retaining the quality of top-rate cuisine. The sausages are all-natural and gluten-free, and come from a handful of farmers who have helped Lanzillota get the right source products for the flavours he wants. “Some of them have been making sausages for 70 years,” he said, adding that the combinations required lots of effort to perfect. Sausages are grilled and served on a roll from Golden Wheat Pastry with a choice of toppings, as you might expect, or sliced and delivered on a plate with dollops of Currywurst — a wonderful spicy tomato curry sauce that surprises you with the flavour. WVRST (pronounced “verst”) recommends you stick with the roll for the game meats and go with the Currywurst for the traditional, poultry or vegetarian options. He said it was created after World War II by a woman who mixed tomato sauce with paprika. Sausages with Currywurst are a popular street food in Germany. Lanzillotta was introduced to it by friends from Berlin. Other than sausages, the only other menu item that’s not a dipping sauce are fries. They’re Belgian-style and include the choice of Plain ($3.50 or $5.50) or Duck Fat Frites ($4.50 or $6.50) that are dipped in the fat left over from the Duck sausages and then fried. So, no burgers, wings or hummus. 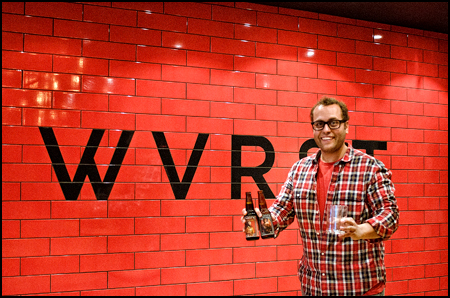 WVRST is all-in on sausages and beer. “Burgers have been overdone,” Lanzillotta said, and he didn’t mean burnt. The fancy burger craze that’s swept through the city often has more to do with what goes on or around the meat. At WVRST, it’s what’s inside the sausages that’s exciting. And Lanzillotta hopes to one day sell them uncooked, so you can pick them up from the restaurant before you head out to the cottage or grill them at home. As for the location on King West, Lanzillotta said the neighbourhood needed something other than bars and nightlcubs. When you walk in, head to the counter to place your order for food and drinks. You’ll get a number and Aldo or one of the servers will deliver when ready. If you’re just having drinks, you can order straight from the bar. When you want a re-fill, you have to repeat the process. Lanzillotta said he chose to do it this way to further reinforce the idea of WVRST being a casual-dining spot. Without a wait staff, you’ll also find that conversations with your neighbour go uninterrupted and the community vibe is enhanced without the formalities involved with giving orders and asking for cheques. German-style beer halls have arrived big time in New York. It’s good to see this one in Toronto has plenty of style, charm and reasons to come back. Note: WVRST is open 11:30 a.m. to 10:30 p.m. Mondays to Wednesdays and 11:30 a.m. to 2 a.m. on Thursdays to Saturdays (with last food order at 12:30 a.m.).